Last year, the People St program opened its first ever application cycle re-purposed road space in Pacoima and Leimert Park for two new Plazas and will bring Parklets to Palms and South Park in Downtown LA soon. LADOT’s award-winning People St Program will open its second application cycle and begin accepting proposals for Plazas, Parklets, and Bicycle Corrals from potential partners starting November 1st! Community Partners will have 45 calendar days or until December 15th to submit their applications for all People St projects. 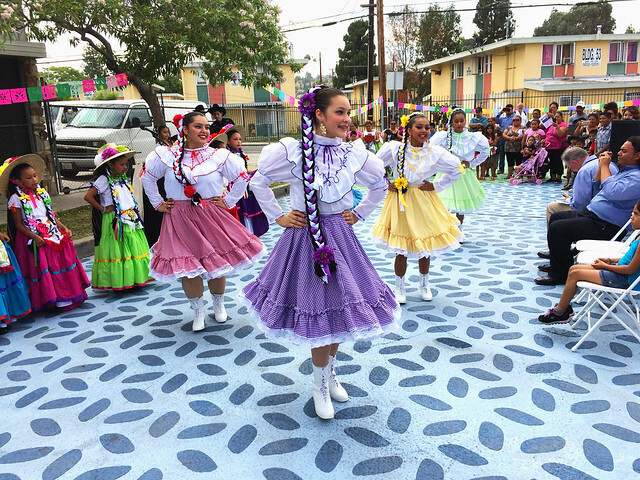 Ballet folklorico at July 30th Ribbon Cutting at Bradley Ave Plaza in Pacoima. Apply for a Bicycle Corral: Instead of a on rolling basis, Bicycle Corrals are now integrated into the application-based process along with Plazas and Parklets! All applications for People St projects will be accepted during the application window period. This helps us prioritize Plazas, Parklets, and Bicycle Corrals all at once and lets us foster better communication between Community Partner applicants. Updated Application Materials: As the People St program continues to grow, we would like to streamline the application process and make applying easier for Community Partners. We’ve made revisions and updates to our application manuals incorporating new information to better guide Community Partners! Kit of Parts for Plazas Went on a Diet: Information from the previous ‘Kit of Parts for Plazas Technical Appendix’ has now been incorporated into the ‘Kit of Parts for Plazas’. Now, Community Partners can refer to the ‘Kit of Parts for Plazas‘ exclusively for information on needed furnishings and programming to construct and activate a Plaza! Keep your Neighborhood Council in the loop: Community Partners are now required to present their proposed People St project to their neighborhood during one of their local Neighborhood Council’s monthly meetings. For a People St project application to be considered complete, a copy of the Neighborhood Council meeting’s agenda or official minutes must be included as proof of presentation. People St 2015 Application Cycle Timeline. Now that you are up to speed on the changes we’ve made and are interested in applying for a project in your neighborhood, start now! All Plazas, Parklets, and Bicycle Corrals application materials and information you need can be found at our one stop shop: peoplest.lacity.org. If you have additional questions, email us at peoplest@lacity.org. We can’t wait to form new partnerships and work with our Community Partners to bring their project ideas to life!